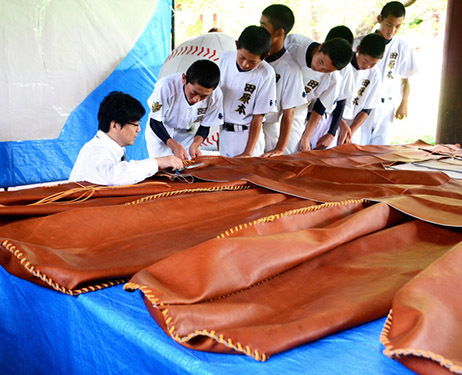 Young ballplayers stitch the glove for the Great Buddha on Aug. 31 at Todaiji temple in Nara Prefecture. The website of Todaiji temple in Nara outlines the site's early history. It goes: When Emperor Shomu (701-756) commissioned the construction of a giant statue of the Great Buddha (the Daibutsu) at Todaiji, he issued a nationwide appeal to his people, asking anyone in support of this Daibutsu project to contribute "one sprig of grass, one handful of soil." Nobuhiro Umehara, 51, believes Shomu sought the cooperation of "ordinary citizens" because he wanted them to be part of his mammoth project. And Umehara says that was exactly how he and his like-minded friends wanted their project to go. Umehara owns a workshop that produces baseball gloves in Yamato Koriyama, Nara Prefecture. 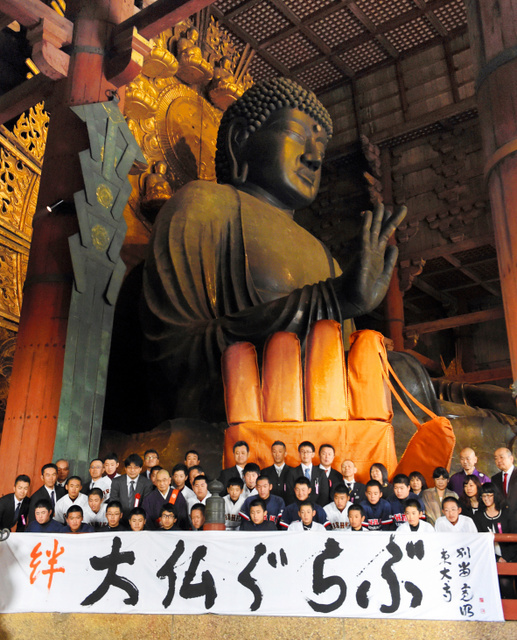 On Dec. 26, he donated to Todaiji a giant baseball glove, measuring 3.6 meters long to fit the Daibutsu's right hand. After the Great East Japan Earthquake of March 2011, Umehara launched a drive to donate baseballs and baseball gloves to young ballplayers of the Tohoku region who lost their equipment in the killer quake and tsunami. Through his nationwide professional ties with high school teachers who coach baseball clubs, Umehara solicited donations of used gloves and other items. Some professional baseball clubs were also happy to pitch in. Last year, a Tohoku junior high school teacher told Umehara that even though many of his students were still living in temporary housing for quake/tsunami survivors, the public's memories of that disaster were already beginning to fade. Could he think of something to help keep the memories alive? The teacher's remarks inspired Umehara to start the "glove for the Daibutsu" project. Made of cowhide, the glove was stitched together by more than 2,000 participants, including young ballplayers. And Todaiji, which has held many ceremonies to console the souls of 3/11 victims and pray for Tohoku's recovery, provided every cooperation. Umehara thinks the temple probably saw this project as the present-day version of Shomu's "one sprig of grass, one handful of soil" drive. The glove will remain in the temple's Great Buddha Hall (Daibutsuden) until Jan. 9. From March 11, it will go on display in Iwaki, Fukushima Prefecture, with the message: "Let's all catch dreams with the Great Buddha's glove." This, of course, is also a plea to the public to remember 3/11.